I know we are barely past the halfway mark of winter, but the last few warm and pleasant days have got me wishing summer was here. 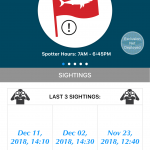 Some swell and lots of south easterly wind are in the forecast for Saturday, so Sunday will be the better option for diving. We will aim for a later start to see how well False Bay fares during Saturday’s onslaught. 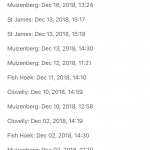 If we decide to launch the boat it will be from the Simon’s Town Jetty at 9.30 and 12.00 and the most likely sites will be Photographer’s Reef and Roman Rock. If the conditions aren’t boat-worthy on Sunday, we’ll shore dive at Long Beach. 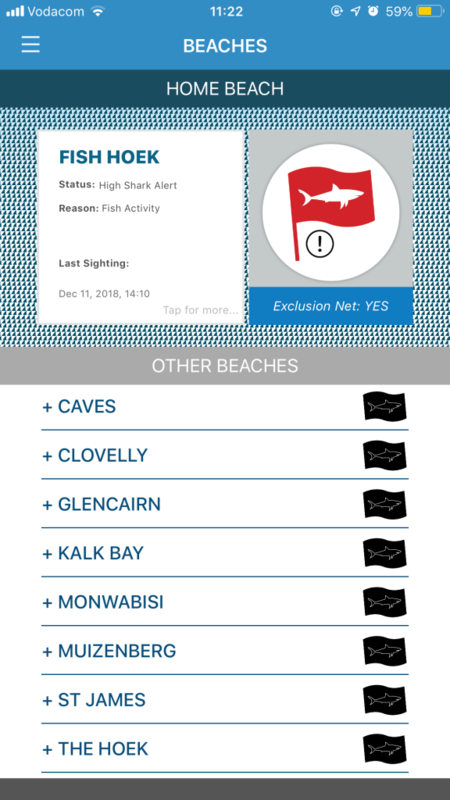 Shark Spotters, who do pioneering beach safety work and shark research in Cape Town, are crowdfunding a mobile app which will provide information on beach and surf conditions, shark and other marine animal sightings, and whether the Fish Hoek exclusion net is currently deployed. The app will be available free of charge. Watch this video for more information about the app, and give your support by donating here! There are also a couple of children’s books to consider. Probably not a good idea to get a mask unless the place you buy it will let the person exchange it if it doesn’t fit! Don’t forget to add a memory card for the lucky recipient’s camera if you plan to gift any of these! Clip Clop designs and prints beautiful tide charts for Cape Town and Durban and moon phase charts for the year. You can order online or find them at Exclusive Books. We feel quite strongly about this, in the same way that some people feel strongly about supporting the SPCA or Amnesty International. So pardon me if I offend you! 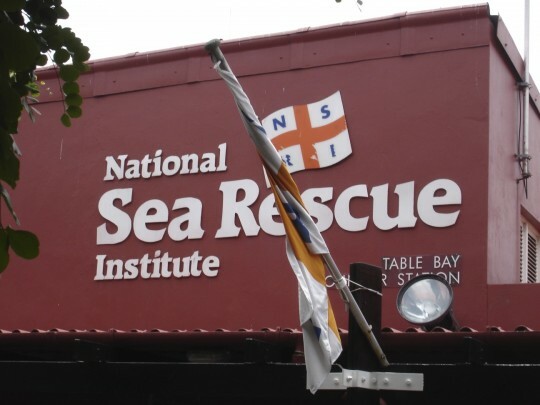 If you’re a water user – scuba diver, boater, fisherman, surfskier, swimmer, surfer, or kite surfer (and I am sure there are more) – then supporting the NSRI is one of the things I think you should consider. 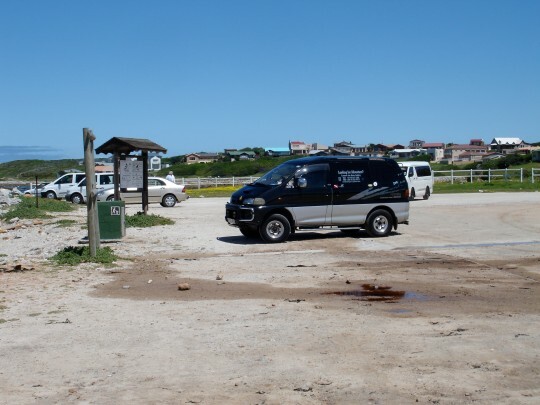 They are entirely staffed by TOTALLY AWESOME volunteers, and do a wide range of work protecting and rescuing those who use the South African coastline. Their work is often dangerous, uncomfortable, and scary, and it’s in every one of our best interests – including the volunteers’ – that they have the most up to date and well-maintained equipment possible. 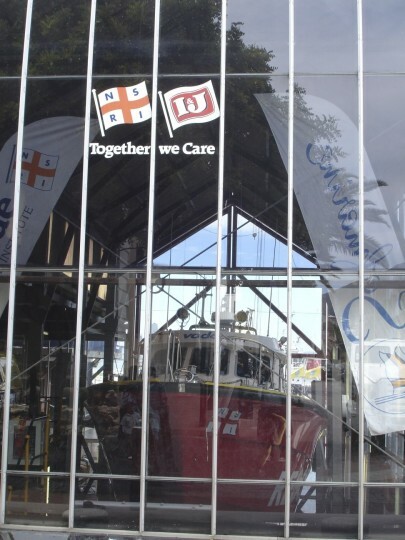 Becoming a member of the NSRI is the least expensive way of showing your support. 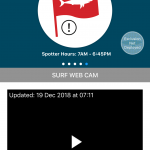 It costs only R100 per year, and you get a subscription to Sea Rescue magazine – three issues per year – which has articles about everything ocean related. Another way to support them is to volunteer. You need to live within a short distance (10-15 minutes I think) of a base station, but they can use the services of even people like me (that is, with no sea legs!) – to make coffee, do administration, and assist at the base. If you know the sea, first aid, navigation, radio operation or anything like that then they’d be thrilled to have you on board. 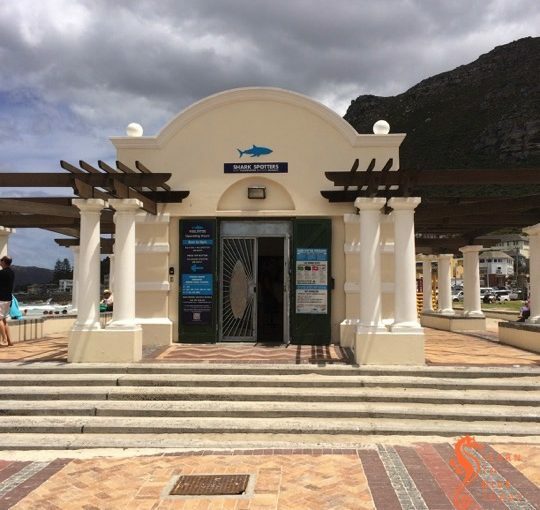 On Saturday 11 December, the Mr Price Anchor Challenge will bring some mayhem to Fish Hoek! This is a multi-event (running, swimming, cycling, paddling) sports challenge that is unlike a triathlon in that there is time between legs to regroup, rest and prepare for the next event. Learn to Dive Today has donated two Discover Scuba Diving experiences to be used as lucky draw prizes, or spot prizes for event winners. The proceeds of this event are being donated to several worthy charities, and we are proud to be associated! Come and say hello at the registration expo on Friday 10 December from 1600 to 2100 at the Valley Christian Church on the first floor of the OK Furniture Building on the corner of Main and De Waal roads in Fish Hoek (opposite Shoprite). 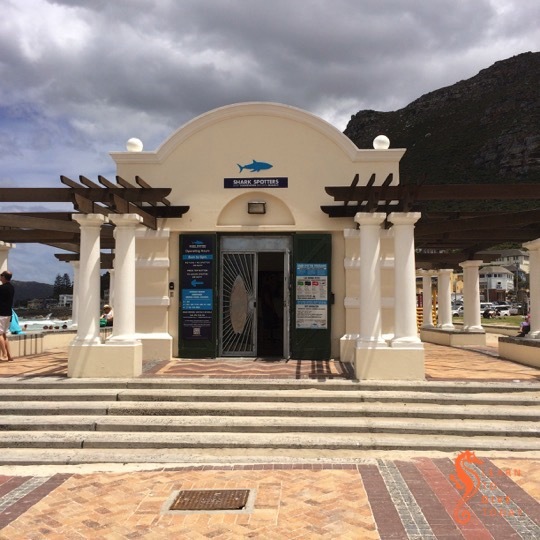 We’ll also be out and about on Fish Hoek beach on race day (Saturday 11 December). Look out for the divemobile and the Learn to Dive Today signage. 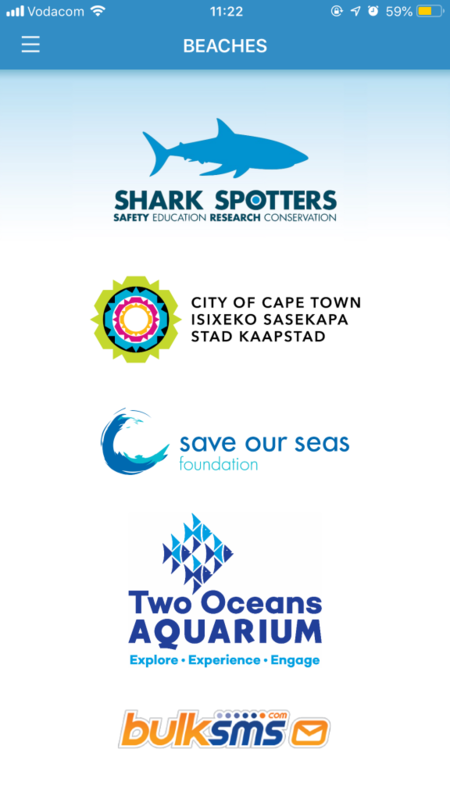 The swim leg will be held in a compact triangle shape that will be bordered by 30 shark shield devices, lifeguards and safety boats. Then, the high activity in the water because of all the swimmers and boats will act as a further deterrent. 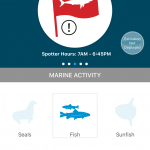 The swim will also be held at a time of day when there is the least marine activity. 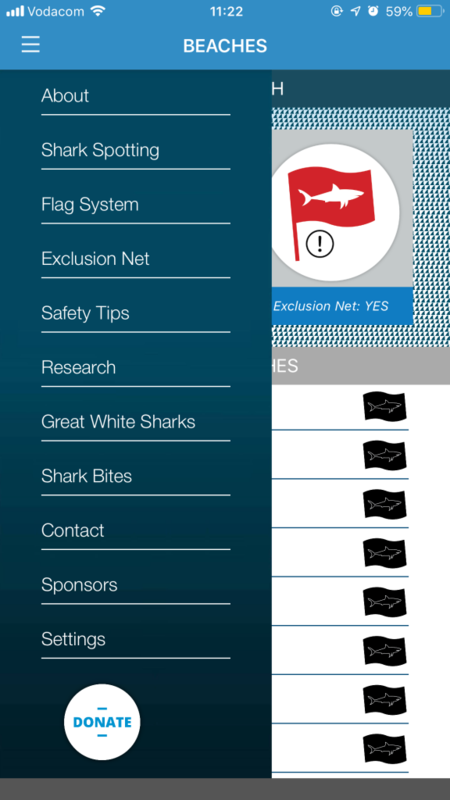 Finally the shark watch program will be operating and we will not run the swim leg should there be any question as to the safety of competitors. 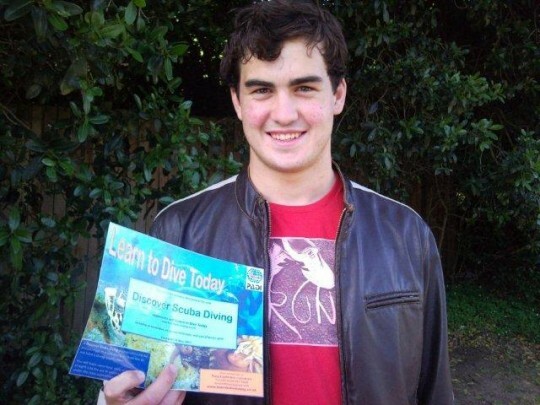 Congratulations to Ruan, the winner of a Discover Scuba Diving experience in the ToadNUTS raffle held last month. 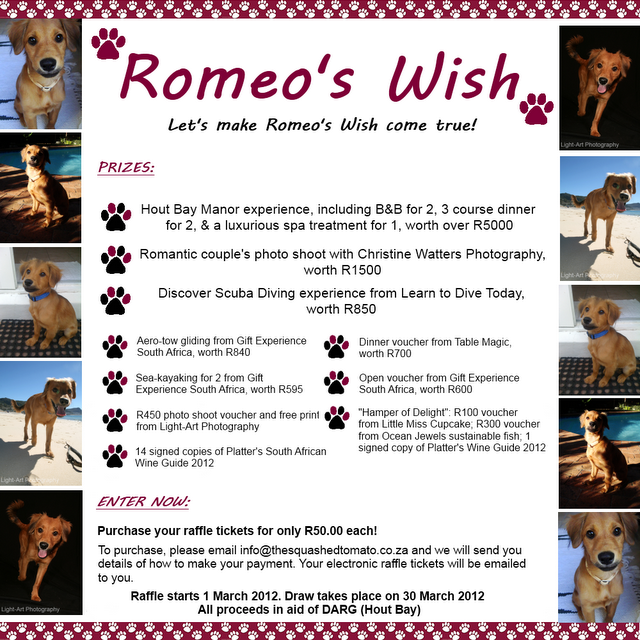 We blogged about this raffle in November. We look forward to introducing Ruan to the underwater world! Anyone who’s had the misfortune to set foot in a shopping mall lately will be aware that Christmas decorations are out, and Christmas shopping is in full swing. 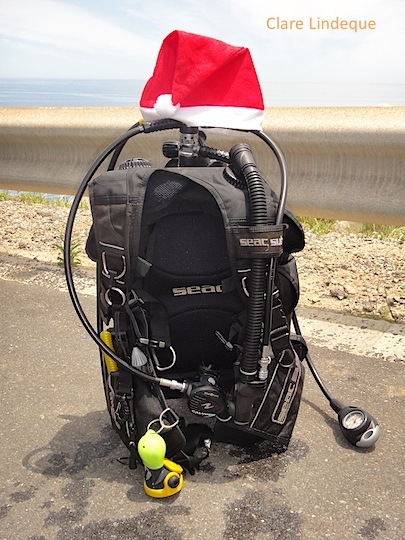 If you have a diver, or potential diver, in your life, getting them something to do with their hobby as a Christmas or Hannukah gift is a good idea. 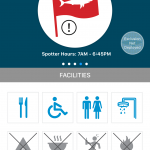 Lucky for you, Learn to Dive Today has suggestions for all budgets! Check out the bookshelf category for book ideas, and the movies and documentaries categories for DVD gift ideas. 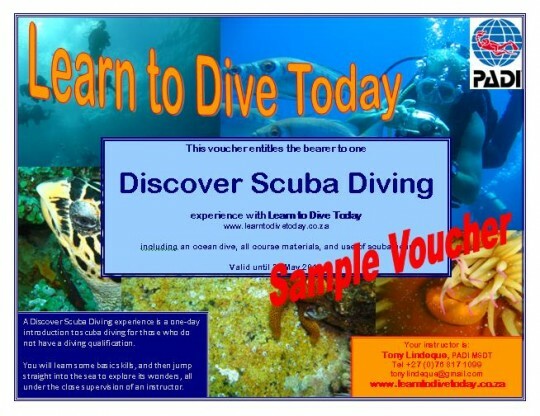 What about a Discover Scuba Diving gift voucher from Learn to Dive Today? The Discover Scuba Diving (DSD) experience is designed for people who have never dived before, and want to try it out – perhaps before committing to a full Open Water course, or perhaps just for the experience. You’ll meet at the beach, have a short briefing explaining the gear and basic dive principles and safety, and then go in the water. Tony will teach you a couple of essential skills – very basic things like mask clearing – and then you go for a dive. That way you get to experience what it’s like to be a diver, first hand, to see if the bug bites! If you enjoy the dive and want to take it further, you can get the cost of the DSD credited towards your Open Water course. If you want to order a voucher, email Tony. 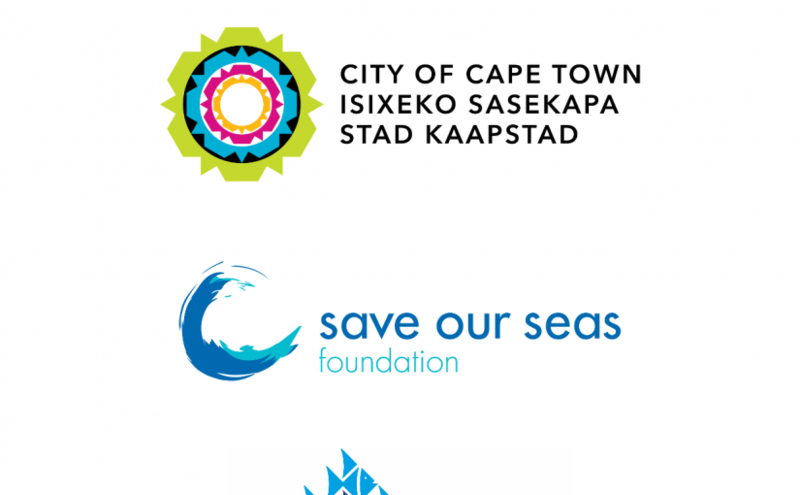 Have you considered making a donation to the organisation of your choice – Reach for a Dream, the NSRI, or SANCCOB for example – on behalf of your gift recipient? This is a very special gift that has the potential to do a lot of good in this world that so badly needs it, and impacts more than just the people giving and receiving the gift. 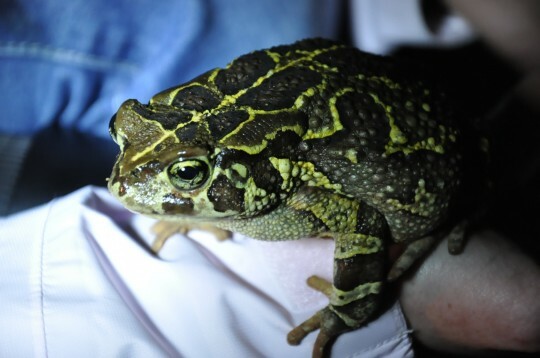 Learn to Dive Today is supporting the conservation efforts of the civilian scientists of Toad Nuts, who work every August to protect endangered western leopard toads as they migrate – often across busy highways – to their breeding ponds across the South Peninsula area. Learn to Dive Today has donated a Discover Scuba Diving experience as a prize in a raffle that is currently on the go to raise funds. The funds will be used to purchase GPS equipment to tag the toads that are rescued during the breeding season. We assisted the Toad Nuts this year, patrolling in Noordhoek and Sun Valley on rainy August evenings looking for toads trying to cross the roads. They are awesome creatures! This is well worth supporting – you’ll be assisting with a very worthy conservation project (and the prizes are cool)! 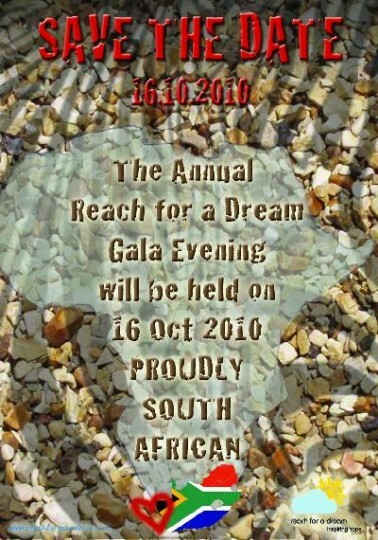 Learn to Dive Today is very proud to be associated with the fundraising efforts of Reach for a Dream. At the Gala Evening being held tomorrow evening at the Westin Grand Hotel, one Discover Scuba Diving experience and one Open Water course will be auctioned, donated free of charge by Learn to Dive Today. We look forward to supporting this good cause by doing what we love best!